Celebrating 125 years of the first Spanish stamp market held in Barcelona, Spanish Mail (Correos) issued a large, colorful commemorative stamp on 8 April 2016. This 57-cent (0.57€) stamp features a vintage photo of stamp collectors in an outdoor stamp-trading venue. This boldly designed stamp measures 40.9 x 28.8 mm (1.6 x 1.1 inches). Background colors represent the Catalonian flag–a yellow field with four red horizontal stripes. Barcelona is the capital of the country’s northeastern autonomous region of Catalonia. The world’s first postage stamps were issued in Great Britain in 1840, followed 10 years later by Spain in 1850. Soon, people began collecting used postage stamps in Spain and in the rest of the world. The first stamp shop for collectors in Spain was opened in 1854 in Catalonia by Josep Maria Vergés. 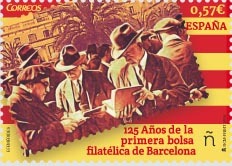 The first stamp market began in Barcelona between 1890 and 1892. Used-book seller Josep Graells Blanch added postage stamps as a sideline to his offerings on Ronda de Sant Antoni during the Sunday-morning booksellers’ fair. Other stamp dealers joined, making it a weekly tradition. Later the Barcelona stamp market moved to Plaça Reial, where it continues to this day, every Sunday from 9:00 am to 2:00 pm. Collectible coins are also traded at the same venue. Plan to visit the next time you’re in town. To add this commemorative stamp to your collection, contact your favorite stamp dealer, find a stamp dealer or visit Spain’s Correos website for further details.